I love a good visual. So I thought I would open with a map of all the participants in this project. Pretty impressive, right? Here’s a link. A few observations…Japan and South Korea are in the house, but no one from China…a reflection of their internet access? So odd, because a disproportionate number of modern day sewing machines distributed here and around the world are built in China. And no one from Greenland. Or Kazhakstan. (I know there are quilters there.) No one from Mongolia or from the middle of Africa. Much of the middle east is silent. A surprising number from South America. I did not know we had so many quilters in that area. Australia and New Zealand, no surprises there. Still not on board? If you are mildly curious, here’s a link to all the block patterns so far. They come up every Sunday and Thursday. If nothing else, it’s a great way to become familiar with new designers and block patterns. We are somewhere around 22 blocks at this point. Those are 6 1/2 inch blocks. As you can see, they are getting harder and harder for me to fit into one frame. I like to piece. Easy, repetitive, simple piecing is unbelievably relaxing for me. Paper piecing needs to be done in the morning or afternoon, but not after a big meal or if I’m tired or stressed in any way. I need all my focus on getting everything in the right place. I didn’t realize how much patience I have lost for anything done by hand. Hand embroidery seems like it takes a lifetime. All I can think of is that I could have digitized this and had it done days ago. And yet, I love the way it looks and I love the threads. This little design took me weeks. Of course, I’m not working on it every minute, just a bit of time here and there. Yet I am loving the texture of this thread. I found this thread at the Wonderfil booth in Paducah. I’m sure many of you have heard of it before. It’s called Razzle. 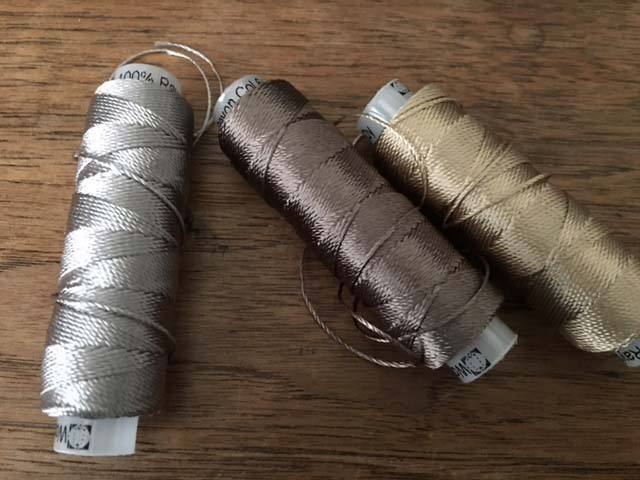 (Yes, they have a metallic looking thread that is called Dazzle). Razzle has the weight of about size 8 perle cotton, but it’s a rayon. So for those of you who are cotton purists, you’ll just have to look away. Me, I fell in love with the sheen and the weight of it. 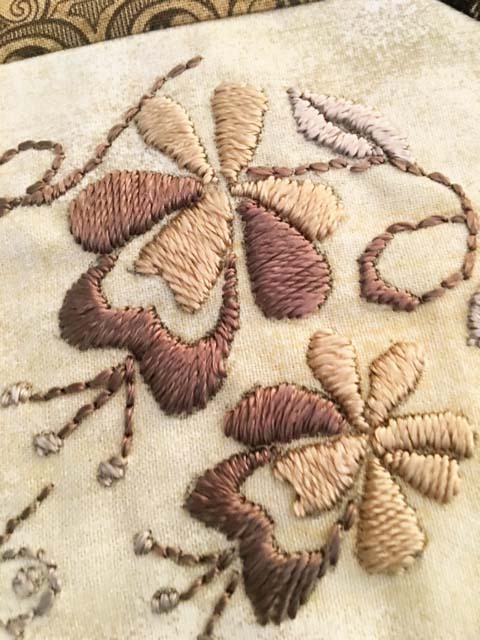 It was a pleasure to use for hand embroidery. This project is only about one fifth of the way done. Eighty or so more blocks to go. Will my stamina hold up? Will I have the patience to learn more new techniques? Will I lose interest in the color scheme half way through? 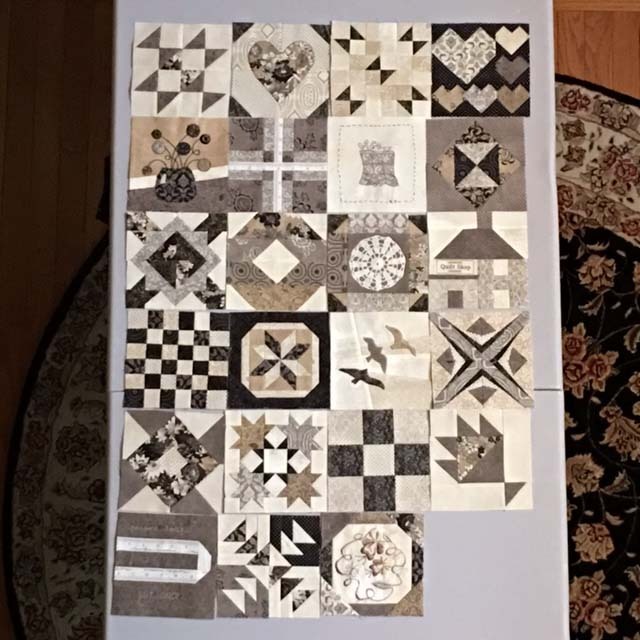 Will I actually create a setting for these blocks after the project is complete and finish the quilt instead of leaving the blocks neatly in their cellophane pockets in the binder? I don’t know. I really don’t. A lot of life can happen in the next 8 months. We’ll both have to wait to find out. 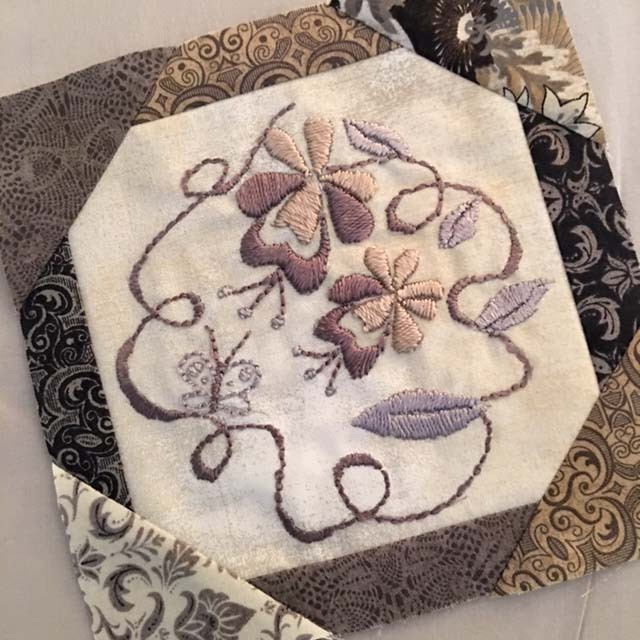 This entry was posted in embroidery, The Splendid Sampler and tagged hand embroidery, Razzle, sewing, Wonderfil by edges. Bookmark the permalink.